Tomorrow I begin a wonderful trip to my friends, Judy and Steve, who live in Montague, CA (just 60 miles south of Medford, OR). Last July I hardly had a proper visit with them since I fell within an hour of arrival and spent most of the time in ER and recovery. This year I will be extra careful so I can take the planned hike and photo shoot. The circuitous route will actually have me playing "musical beds" (instead of musical chairs). Another objective is to meet up with my sister Nadine and Owen who are driving from their home in Canada to spend five months in Palm Springs - I'm hitching a ride from Seattle to Montague, getting in a visit with sister Debbie and Rocco in Seattle, too. An absolute highlight and thrill for me is getting to see Aunt Flora in Tacoma and some of her family while on this trek. Deb and Nadine had a visit last April. I am so excited and will get the visit with my sisters along. The last time to see Aunt Flora and cousins was perhaps when I was about 12 years old; an opportunity presented itself in 1968, but due to sad circumstances at the time, their family was traveling. Contact was lost over the ensuing years. top row: 2nd from left, Karen; far right, Nadine. 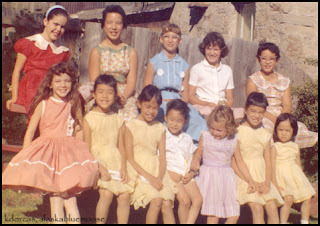 bottom row: Crystal, the Flora Wong cousins, with our sister Diane in purple. 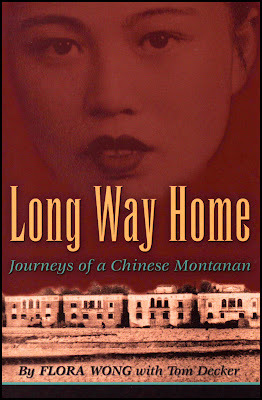 Since I am a bit late in getting ready to head out in the morning and it is now 3:00 am, I will provide a couple of links below to Aunt Flora's book Long Way Home, Journeys of a Chinese Montanan and a link to what Nadine wrote at her site. Nadine provided a detailed synopsis with photos. Since reading the book three times, I believe it is an awesome legacy for the family and for historians. Aunt Flora's own story is filled with some wonderful insight of circumstances that I was unaware of - her mother was such a strong vibrant force in providing her family with a means of returning to the U.S. and made sacrifices to do so. A very warm and touching story of adapting to a different way of living, in both countries. As you will read, Aunt Flora went on to become an athlete in swimming the last 30 years with a multitude of medals and accomplishments. A truly amazing woman in her own right. Please click on the book photo or this line to link to Amazon. Click on this line - TO LINK TO NADINE'S SYNOPSIS. Other visits on this trip (remember: musical beds) will be with long time friend and co-worker from my 30 years at KPC, Jean, in Portland; my beautiful lacebook collaborative super woman artist, Liz, in Eugene; and, a visit with Alaska friend and artist transplanted in Portland, Roxanne, who was here in Alaska last month and we did a couple day outings with our cameras. How amazing that you have this fabulous memoir from your aunt to understand your family's history. It must be wonderful to have such a treasure; she sounds fascinating. Have a wonderful time on your trip -- and thank you again for the delicious salmon! Have a safe trip my dear friend! Enjoy all that nice warm weather with your friends and relatives!! That was one fascinating glimpse into your life, Karen! Love the 1950s picture of all the pretty little girls in their cute dresses, and I am now going to have a closer look at your Aunt Flora's book.